Having never heard of the Center for Oceanic Awareness, Research, and Education (COARE)¹ and little to go on, since the website is meager (which would come to be a point I had to address later), I envisioned a typical cubicle job where I would sit and type away on whatever project Mr. Boss Man had instructed was necessary. Saving the world one beach-clean-up day-report at a time! Thus was the extent of my not-for-profit expertise. Little did I know I would be one-man-banding the organization’s finances, running my own campaign, and researching everything from how much water it takes to make a paper cup (103.6 oz)² to how many hooks an ‘artisanal fisherman’ has (anywhere from 4,000 to 20,000 due to the undefined vagueness of what it means to be artisanal³). Turns out there is a reason for the shabby website and little news press; the organization is tiny. I mean no staff, no office, and 3 unpaid interns tiny. Don’t let the size fool you though. From changing plastic bag policy to creating shark safe certifications for restaurants⁴, this rag-tag team gets a lot done with very little. How can this be, do you say? From the sheer passion and devotion of the board and crew to help save the environment in whatever way they can. I am proud to now call myself part of the team, and have cards to prove it! Although I have yet to give one out to someone who isn’t a friend I am showing off to. Filled to the brim with erupting excitement, I have hit the ground running with grants to write, campaigns to market, and extensive research to be done. While I don’t have anything to report, mostly in the preliminary stages as of yet, I await the moment when I can divulge all the intricacies that I have been working on. 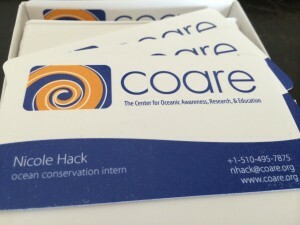 This entry was posted in 2014 The Center for Oceanic Awareness, Research, and Education on June 25, 2014 by Nicole Hack.